A Source is the specific source of traffic. For example, if your company has an internal media buying team, the specific team would be a Source. If your company runs traffic through a 3rd party affiliate channel, each specific affiliate would be a Source. 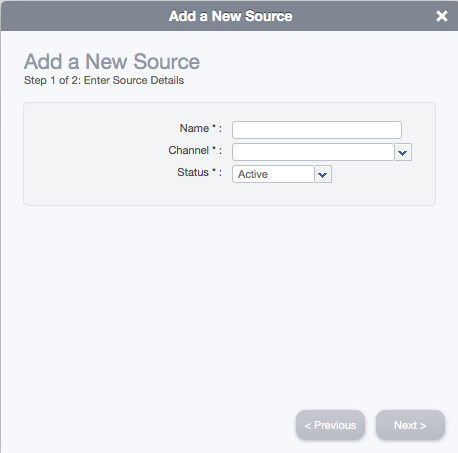 Hover over Channels, then hover over Sources, and select "Add Source". The Add Source wizard will display and walk you through the process. From the Channels sub tab, within the Channel grid, select the icon to the left of the Channel that needs a new Source. Click on the Add Source button in the top right corner. The Add Source wizard will display and walk you through the process. Name: This could be "Google" for search traffic, or the name of your specific Affiliate for affiliate sources, etc. Channel: The Source's channel. If your Source is within Search, Email or Video, a second dropdown will appear giving you the option of selecting a CAKE integration partner. Status: Select Active, Inactive or Pending. Traffic cannot be run outside the active status. Select Next, then Finish to create the Source card.